The Lift Table was privately commissioned and built for Howard S. Wright offices in Seattle, WA. 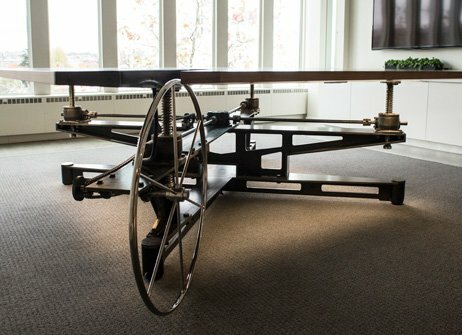 More than a table, this work of art constructed of steel, wood and glass, spans ten feet and elevates twelve inches with the turn of a ship’s wheel. Semigood Design, LLC approached Joyce/Dayton with a concept for a unique conference room table that combined both bold and functional handcrafted elements. Inspired by the customer’s ingenious concept, Joyce engineers offered a creative, mechanically sound solution. The resulting lifting system was a perfect fit in both form and function. Four ten-ton screw jacks are joined with shafting to a central miter gear box to provide support for the lift table system. The drive component includes a chain drive that connects the ship’s wheel to a sprocket on a drive shaft. All jacks lift in unison when the ship’s wheel is rotated. Why work with Joyce Engineers? Using the Semigood Design LLC concept, Joyce engineers, mindful of critical details, developed a complete lift system which included a four-way miter box, shafting, couplings and shaft support bearings. Key to the system’s success was the need to move all four jacks simultaneously and then hold position. Joyce engineers took the guess work out of the design by laying out a lifting system and recommending the correct combination of self-locking jacks with either right-hand or left-hand gear sets. Compatible system components like the four-way miter box, shafting, and couplings were also recommended. Since 1873, Joyce/Dayton Corp., with headquarters based in Dayton Ohio, has been one of the premier manufacturers of rugged, heavy-duty mechanical lifting and positioning equipment. Joyce/Dayton products are currently used throughout the world to lift and position everything from material handling and packaging equipment, to complex self-leveling systems. They move earth station antennas, and huge solar arrays. They can be found everywhere from the clean room of a test lab to mine doors and oil field equipment. With unmatched engineering and technical expertise, Joyce can provide custom solutions in a time- and price-sensitive manner, turning ideas into working solutions.